This outstanding example of an early 16th century timbered farmhouse is located on farmland on the North Downs. 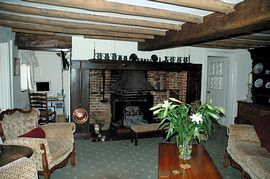 With it's inglenook fireplace, antique furniture and low timbered ceilings, you are assured of a warm welcome and an abundance of atmosphere. The gardens overlook open countryside and are available for the enjoyment of our guests as is the beautiful timbered lounge. There is ample off road car parking. The bedrooms are comfortably furnished with antique furniture and fine bed linen. There are tea and coffee facilities in the rooms. Many historic houses are on our doorstep including Chartwell, Hever Castle, Down House, Quebec House and many many more. Visiting London is very convenient on public transport from outside the house. We are renowned for the quality of our award winning breakfasts and all our food is locally sourced. We especially ask our guests to treat our home as theirs. Situated on A233 between Westerham and Biggin Hill.